India has around 430 million workers in various unorganized sectors.The unorganised sector workers contribute close to 60 percent of the country's gross domestic product but remain amongst the poorest and most vulnerable sections of society. With a view to providing social security to unorganised workers, including landless agricultural labourers, the Government enacted the “Unorganised Workers’ Social Security Act, 2008”. The Act provides for constitution of National Social Security Board to recommend social security schemes, namely, life and disability cover, health and maternity benefits, old age protection and any other benefit as may be determined by the Government for unorganised workers. 1.The Rashtriya Swasthya Bima Yojana (RSBY) was launched in 2008, to provide smart card based cashless health insurance cover of Rs. 30,000/- per annum on family floater basis to BPL families (a unit of five) in the unorganised sector. 2.The Aam Admi Bima Yojana (AABY) was launched in 2007 with a view to providing insurance cover to the head of family or one earning member ofrural landless households between the age of 18 years and 59 years. 3.The Indira Gandhi National Old Age Pension Scheme (IGNOAPS) has been expanded by revising the criteria of eligibility. All citizens above the age of 60 years and living below poverty line are eligible for benefits under the scheme. As per Census, 2001, there were more than 10.67 crore landless agricultural workers. Out of which about 5.73 crore were men and about 4.94 crore women. The female and male landless agricultural labourers are in the ratio of 54:46. Moreover,As per Economic Survey, 2011-12, the agriculture sector accounts for 12.3% of the Gross Domestic Product (GDP) in 2010-11. Is this schemes provide enough social security? Even on a first cut analysis, we can understand that these schemes are not enough to provide the necessary social security for nearly 40 percent of the total population which constitutes the unorganized sector employees. Recently the National Advisory Council has questioned the central government for failing to formulate a social security package for India's 430-million informal sector workers. NAC said except for the Rashtriya Swasthya Bima Yojana (National Health Insurance Scheme), which covered close to 90 million people, little had been done to extend other social security benefits to the working poor in the country. It said the workers were engaged in multiple economic activities for survival, had no fixed employer-employee relationship and worked long hours for very low wages. The report of NAC pointed out that unorganized sector workers lacked sufficient access to income, food and basic social security such as healthcare, childcare, insurance and pension. Women, who constituted a large proportion of the informal workforce, were particularly vulnerable since they shouldered both productive and reproductive responsibilities, it said. 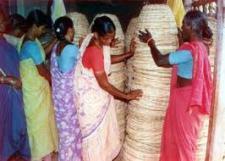 "They (women) are often engaged in the most hazardous of work and earn substantially lower wages than men," said NAC. NAC also said there was little convergence between the various schemes being administered through the finance ministry (for pension), labour ministry (for health insurance) and women and child development ministry (for maternity benefits). On taking the advice of NAC, The Govt is formulating a plan to initiate a flagship program - Comprehensive Social Security Package before the next general elections. The plan, according to an NAC member, is to issue one entitlement card to every worker in the unorganized sector to avail of benefits available under schemes such as health and life insurance, maternity care, disability and pensions coverage. NAC is considering a plan to make the finance ministry the nodal agency for approving fund allocation and the labour ministry responsible for enrollment, besides setting up a National Social Security Authority (NSSA) to oversee plan implementation.